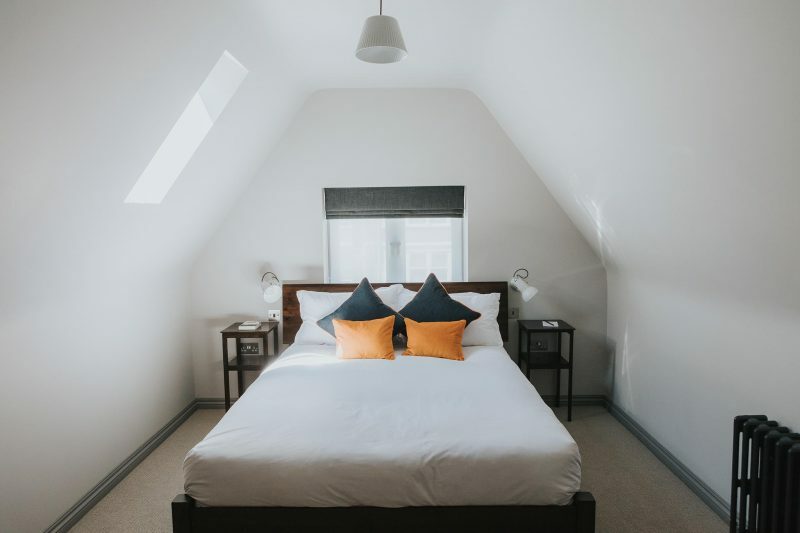 The Ginger Pig offers guest accommodation in 11 en-suite double rooms situated across two floors. 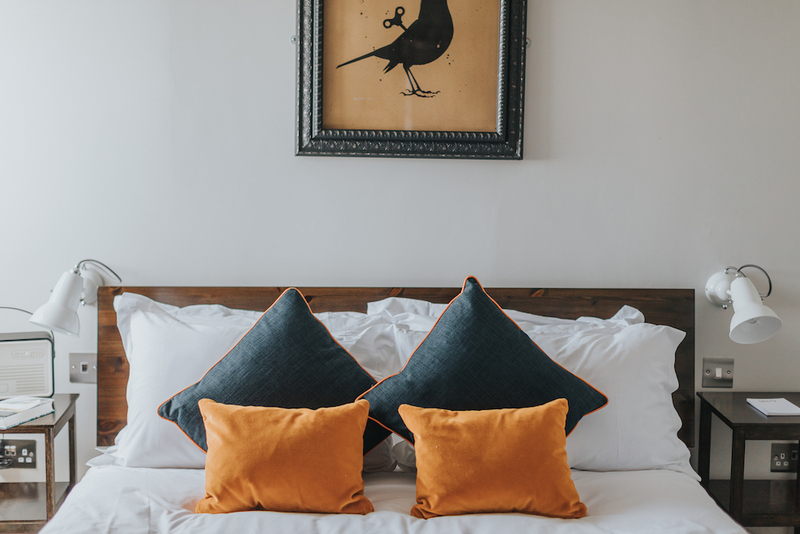 Our boutique hotel style naturally follows the Ginger philosophy of simple and understated, designed with maximum comfort and enjoyment in mind. 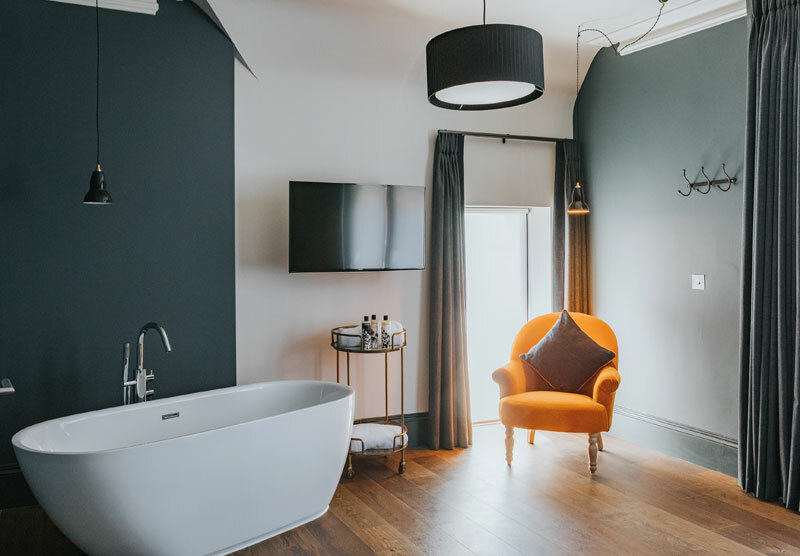 Each hotel room features an oversized shower or stand-alone bath tub, Cowshed bathroom products, luxury Royal Warrant ‘Hypnos’ mattresses, high thread-count linen, Nespresso-style coffee machines, and premixed ‘Ginger’ cocktails. Listed in The Sunday Times top 100 British Hotels! 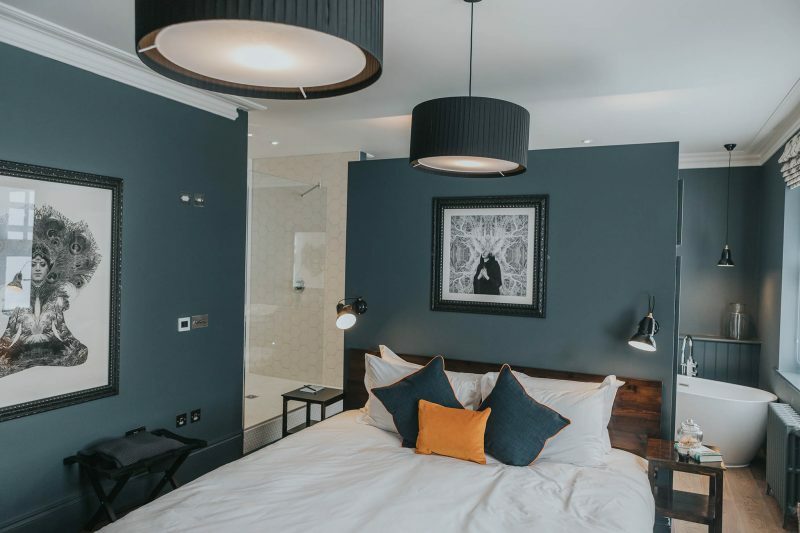 An overnight stay with us will allow you to explore the vibrant city of Brighton & Hove whilst retreating to relaxed and comfortable surroundings. We are just a 15minute walk, or 5minute bus ride, away from the centre of Brighton & Hove. And we are literally 2 minutes across the road from the beach! In warmer months our renowned beach is the local’s hangout of choice with it’s famous brightly coloured beach huts, green lawns and notorious pebbles. If you’re looking to explore the beautiful South Downs you will have easy access by car, or bus, without having to navigate through the city centre traffic. We have 3, king sized hotel rooms, all en-suite. Breakfast is offered in our Restaurant Bar Area, at an additional cost if required. We have 5, king sized hotel rooms, all en-suite. We have 2 luxury, double sized, hotel rooms. These rooms are bright and spacious, have a free-standing bath within the room and a separate en-suite bathroom with rain shower. 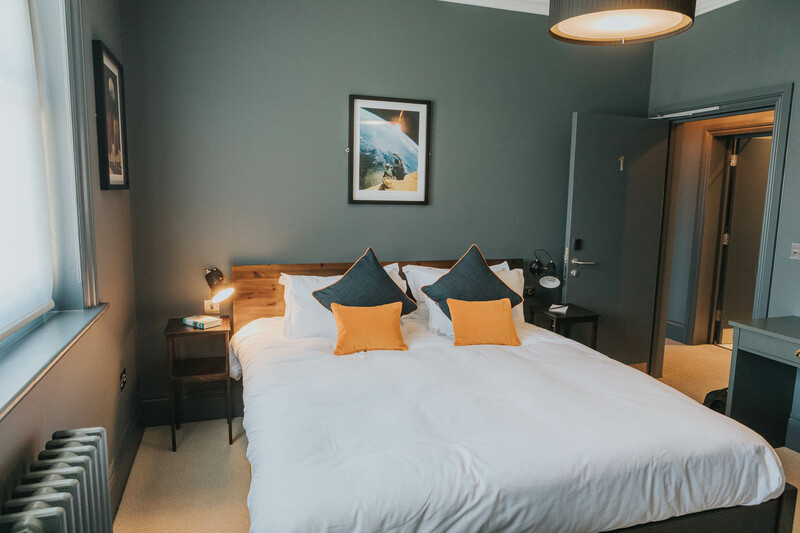 If you would like to book, or you have booked, via our website for a Friday & Saturday night stay why not add Sunday night at a discount rate of 50%? (Offer excludes bank & festive holiday periods. Offers are applied on request and at the time of booking). For availability and more information please call 01273 206577. If you are staying in our hotel rooms and looking for parking the nearest all day parking is located on Princes Crescent, just one street away from the Ginger Pig. Parking is available there all day at £5.30, this can be paid via the machine or by PayByPhone app. Please see the map for more info. You will NOT find a room in a Brighton Hotel with better attention to detail. Trust me I know ... I’ve stayed in most of them and managed a few. Room 3 I believe is the biggest and we were generously upgraded to it . Nothing has been forgotten and it’s been designed with thought for the user. The shower is as big as a king size bed , the freestanding bath and the rest of the bathroom area are thoughtfully lit. Gorgeous Cowshed products , fluffy robes and towels a plenty. Hypnos bed and quality linen allow for a comfortable nights sleep and the TV has plenty of choice as does the mini bar ! Turn the underfloor heating off when you get in and I dare you to find a better room. . Yes it’s not directly on the front and yes it may be a little too far out of Brighton for some but that just means it’s quieter which gets our vote. We adore the slightly Davina Macall fabulous restaurant manager/ matre d . She is professional but with warmth and personality and the food in the restaurant was nice enough but there are better eats to be found in Hove and Brighton. Grab a cocktail take it upstairs and relax in a near faultless room. Bravo Gingers... we will be back ! What s great find !! Great staff all round brilliant food and rooms are just right !! An absolute recommendation!! I’m definitely going back !! Very friendly reception, nice bedroom with en-suite shower of high quality. Comfortable bed and plenty of space in a large double. Substantial and well-cooked breakfast. All the staff, without exception, were smiling, friendly and helpful. We will return. I’m torn between giving a hugely-deserved 5-star review (unheard of in my case, as disliking hotels, I’m usually the customer-from-hell) and wanting to keep the Ginger Pig a secret so that I can get a future booking. Excellent value, outstandingly well-equipped room, great food and service. If I can ever book in again - because you deserve to be full every night- I will be! Booked a surprise weekend break mid September and it was lovely. Very smart accommodation with lots of lovely personal touches. Warm and lovely atmosphere in the bar with friendly service. The food is stunning with the breakfast pancakes being the absolute best I’ve ever eaten. Would highly recommend a stay here in this great location, thank you for a really lovely weekend.